^ a b National Climatic Data Center. "NCDC Storm Events-Select State". Storm Events Database. National Oceanic and Atmospheric Administration. Archived from the original on 2009-05-09. Retrieved 2010-03-02. ^ "At Least 10 Dead After Supercell Tornado Demolishes Kansas Town". FoxNews.com. May 5, 2007. Retrieved 2007-05-05. ^ KAKE-TV. "Greensburg Tornado Rated at EF-5". Archived from the original on 2007-05-09. Retrieved 2007-05-06. ^ KAKE-TV. "Police Officer Injured In Tornado Dies". Archived from the original on 2007-09-28. Retrieved 2007-05-09. ^ "Deadly twister flattens Kansas town". CNN. Archived from the original on May 10, 2007. Retrieved 2007-05-05. ^ "SPC Storm Reports for 5/4/07". Storm Prediction Center. May 4, 2007. Retrieved 2007-05-05. ^ a b c d "One Year after Tornado, Greensburg Still Struggling to Survive". Insurance Journal. Retrieved 2016-04-02. ^ a b c "How Kansas Tornado Became a Monster". news.nationalgeographic.com. Retrieved 2016-04-02. ^ US Department of Commerce. "Daily Weather Maps, Saturday May 5, 2007". Retrieved 2007-05-14. ^ a b Davies, Jon. "CAPE/CIN (J/Kg, Saturday May 5, 2007)". Archived from the original on June 5, 2007. Retrieved 2007-05-14. ^ a b c Davies, Jon. "The Greensburg Tornado Environment on 4 May 2007". Archived from the original on May 16, 2007. Retrieved 2007-05-14. ^ NOAA, National Weather Service. "Tornado Watch 227". Retrieved 2007-05-14. ^ Storm Prediction Center. "May 5, 2007 1300 UTC Day 1 Convective Outlook". Retrieved 2007-05-14. ^ US Department of Commerce. "Daily Weather Maps, Sunday May 6, 2007". Retrieved 2007-05-14. ^ a b "SPC Storm Reports for 5/5/07". Storm Prediction Center. May 5, 2007. Retrieved 2007-05-05. ^ Storm Prediction Center. "May 6, 2007 1300 UTC Day 1 Convective Outlook". Retrieved 2007-05-14. ^ "SPC Storm Reports for 5/6/07". Storm Prediction Center. May 6, 2007. Retrieved 2007-05-07. ^ "SPC Storm Reports for 5/7/07". Storm Prediction Center. May 7, 2007. Retrieved 2007-05-08. ^ National Climatic Data Center. "Event Record Details: (04/1721)". National Weather Service. Retrieved 2008-02-29. ^ "KDDC  - Tornado Warning". Archived from the original on July 15, 2014. Retrieved 2008-02-29. ^ Robb Lawson. "Barton and Ellsworth County Tornado". National Weather Service. Retrieved 2007-05-05. ^ Herb White. "Aware: Climate, Water, Weather" (PDF). National Weather Service. Archived from the original (PDF) on 2008-04-11. Retrieved 2008-02-29. ^ CNN. "Survivors sought as more storms threaten Plains". Archived from the original on May 9, 2007. Retrieved 2007-05-06. ^ KAKE-TV. "Greensburg Meteorite Recovered". Archived from the original on 2007-09-28. Retrieved 2007-05-09. ^ "Search Resumes in Devastated Kansas Town". Archived from the original on 2007-05-10. Retrieved 2007-05-05. ^ a b c NWS Dodge City. "Greensburg Tornado Rated EF-5 (updated May 22)". Retrieved 2007-05-22. ^ National Climatic Data Center. "NCDC Storm Reports". National Weather Service. Archived from the original on 2009-05-09. Retrieved 2008-02-29. ^ "Sedgwick County Tornado Details". National Climatic Data Center. April 26, 1991. Retrieved 2007-05-05. ^ "Butler County Tornado Details". National Climatic Data Center. April 26, 1991. Retrieved 2007-05-05. ^ "Greensburg Suffers Significant Damage In Tornado". Archived from the original on 2007-05-08. Retrieved 2007-05-04. ^ KAKE-TV. "Soldiers Accused of Looting in Court". Archived from the original on 2007-09-28. Retrieved 2007-05-10. ^ CNN.com. "Looting suspects arrested in storm-ravaged Kansas town". Archived from the original on May 17, 2007. Retrieved 2007-05-08. ^ "Red Cross Safe and Well Website". Archived from the original on 2006-11-30. Retrieved 2007-05-04. ^ KAKE-TV. "Animals Are Tornado Victims Too". Archived from the original on 2007-09-28. Retrieved 2007-05-09. ^ NWS Omaha, Nebraska. 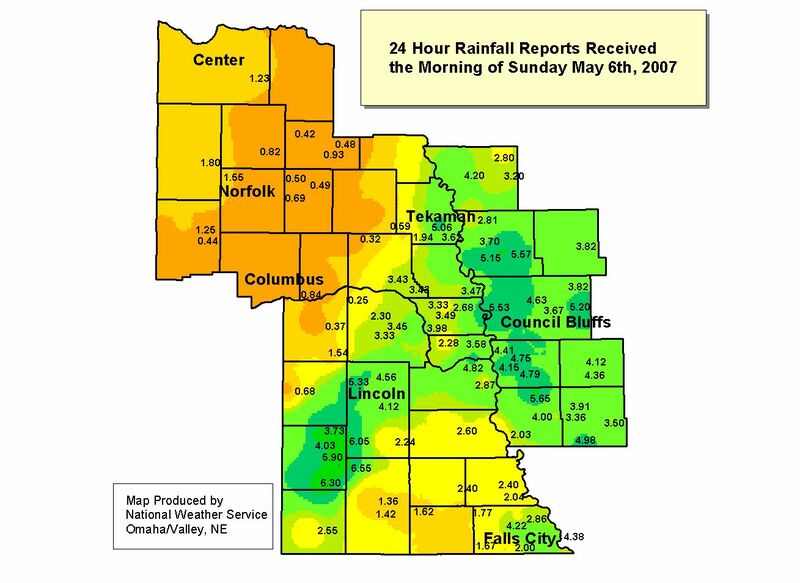 "24 Hour Rainfall Reports Received the Morning of Sunday May 6th, 2007". Archived from the original on June 20, 2007. Retrieved 2007-05-07. ^ NWS Topeka, Kansas. "24 hour precipitation ending around 7 AM May 6, 2007". Retrieved 2007-05-07. ^ NWS Wichita, Kansas. "Weekend of Severe Weather For Central Kansas!". Retrieved 2007-05-07. ^ NWS Bismarck, North Dakota. "Precipitation Totals - May 4–7, 2007". Retrieved 2007-05-07. ^ "Public Weather Warnings for Canada". Environment Canada. May 5, 2007. Archived from the original on May 5, 2007. Retrieved 2007-05-05. ^ "Special Weather Statements for Alberta". Environment Canada. May 5, 2007. Archived from the original on September 9, 2007. Retrieved 2007-05-05. ^ CNN.com. "Missouri flooding keeps sandbaggers busy". Archived from the original on May 18, 2007. Retrieved 2007-05-11. ^ NWS St. Louis. "MODERATE TO MAJOR FLOODING EXPECTED ON THE MISSOURI RIVER". Retrieved 2007-05-08. ^ KAKE-TV. "Riverfest Deals With Rising Water". Archived from the original on 2007-09-28. Retrieved 2007-05-11. ^ NWS Wichita. "Record and near Record Flooding the 2nd week of May". Retrieved 2007-05-14. ^ NWS Aberdeen, South Dakota. "Record Rainfall". Retrieved 2007-05-07. ^ NWS Sioux Falls, South Dakota. "Storm Total Rainfall Reports for the Weekend". Retrieved 2007-05-07. ^ McGahee, Alvin (June 1, 2007). "Selected U.S. City and State Extremes May 2007". NCDC. Retrieved 2008-02-05. ^ KOCO-TV. "State Of Emergency Declared For All 77 Counties". Retrieved 2007-05-08. ^ NWS Denver, Colorado. "NE Colorado Snow Event Recap May 5–7, 2007". Retrieved 2007-05-07.